Pinterest isn’t just for wedding planning. Shocking right?! Actually, I’m sure you know Pinterest is an awesome visual search engine and it can be used not only for wedding planning but for baking a cake, restoring your kitchen, finding crochet patterns and selling on Etsy. Wait, what? 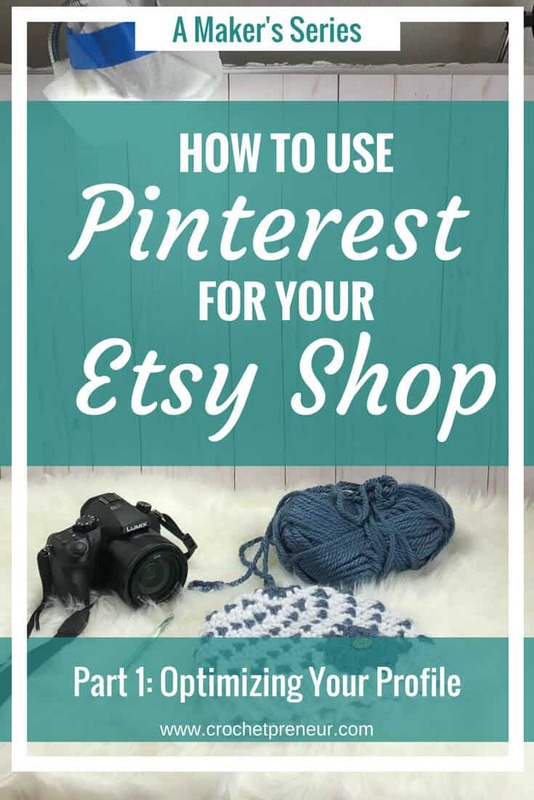 Didn’t you know you can use Pinterest for your Etsy shop? It’s true! In fact, more an more buyers are heading to Pinterest to search out artisan-made products, unique and beautiful fashion accessories, and, yes, to search out the perfect handmade gift. So, now is the perfect time to establish a pinning strategy that will leverage those Pinterest searchers and turn them into buyers for your Etsy business. I’m going to assume that you’ve already got a Pinterest business account. If you don’t, go ahead and click here to set up a business account. Once you’re ready, we’ll set up a profile that will really speak to your customers and give you the opportunity to engage with them more. Just follow these simple tips. Yes, add your profile picture. A picture of YOU. I want to see our smiling face and so do potential customers. Buyers of handmade products, in particular, want to know that they’re buying from a person, not a nameless, faceless corporation. So, using your logo in this valuable real estate doesn’t speak to your personality, your artistry and your talent. Instead, put a clear, smiling, headshot of yourself in your profile. To do that, simply click on “change picture” and select your photo from your computer. For branding purposes, select the same image that you use for your Etsy shop profile picture and on social media platforms. A little tip: while I use the word “crochet” on my business title, that is because my target customers are crocheters. If you are selling handmade fashions or photo props or geeky decor, be sure to use those keywords and not “crochet”. Learn more about this philosophy in my article, Why You Need to Stop Selling Crochet if Your Want Your Business to Succeed. Here, you have 160 characters to tell the world what you do and invite them to connect further. In the first part of your description, speak to the heart of your ideal customer by telling them, succinctly, who you help and how you help them. For example: “I help new moms wrap their babies in the soft comfort of an heirloom blanket.” This would be in contrast to “My name is Sue and I make crochet baby blankets.” Do you see the difference? Then, add a link to your email opt-in – be sure to provide them with something of value in return signing up. This could be a coupon for free shipping, a 10% off promo code, or a free gift with their first purchase. Just be sure to offer them something that they’ll find valuable enough to give you their email address in exchange. If you’ve only got an Etsy shop and no other online presence, add your shop URL in the “Claim a Website” field. You won’t be able to verify the website because it belongs to Etsy, but that’s OK for now. However, if you have a separate website for your shop (say a blog or e-commerce site), include THAT URL here. Then, verify the site following the instructions in Pinterest. This is so you can drive customers to your OWN site, first, where you can collect e-mail address, establish a brand presence, and, then, send them to Etsy if you’d like. OK, so how simple was that? And even though it was simple, having this optimize profile will go a long way toward improving your reach, engagement, and sales when you use Pinterest for your Etsy business. I’m so excited to you…and for me, because I just know we’re all going to grow through this process!